Precious and few. That pretty much describes the rain across most of New England today. In some cases, we completely missed out on the rain. In others, it was just enough to keep the dust down. Our weather system was potent, but was moving too fast and couldn't conjure up enough moisture for a widespread rain. Unfortunately, another dry spell will unfold in the coming days. We'll miss out on a potential soaker tomorrow as it dives underneath us and out through Long Island. Glancing shot at some showers in Southern Connecticut, Rhode Island and The Islands, while the rest of us see a variable sky. High pressure heads into New England for the weekend, supplying us with coastal sea breezes and tons of sunshine. Eventually, that high moves offshore and starts pumping in the sticky air. That starts on Sunday, but won't finish until the middle of next week. This will raise the humidity to uncomfortable levels AND heighten the risk for storms/downpours. We're hopeful that some beneficial rain may fall, but we're not promising a soaking for every community. The very nature of this rain is random and scattered, like any type of convective precipitation. 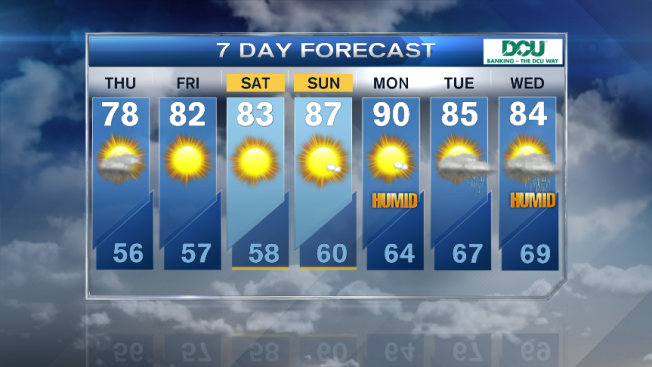 Hottest part of the next 7-10 days seems to be the Sunday/Monday combination. Get those A/Cs ready!